The NCC believes that comprehensive environmental approaches are the most effective way for colleges to reduce alcohol use and alcohol related problems. Multiple levels of prevention are applied across the campus and the community to change individual and community norms and behaviors. 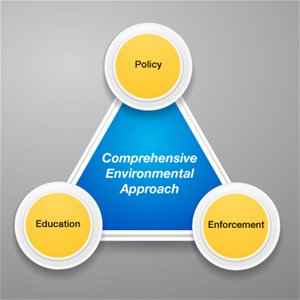 The Comprehensive Environmental Prevention Approach is based on the ecological model of health. This model suggests that there is a direct relationship between an individual’s environment and his or her attitudes, behaviors, and health practices. 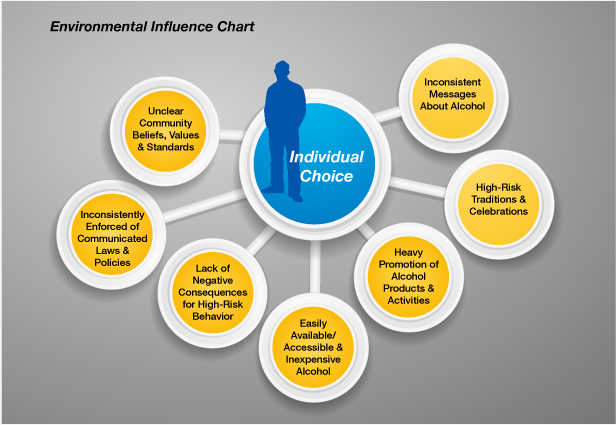 Effective alcohol prevention efforts are comprehensive and address both individual and environmental variables that contribute to the problem. These efforts include prevention, early intervention and treatment. Effective college programs include multiple programs, policies, activities and interventions that address all factors that contribute to high-risk drinking among students. Research has shown that when used in isolation, educational approaches have limited effectiveness; in order to be successful colleges must also make changes in the campus community environment and address individual-focused interventions for high-risk drinkers. The NCC developed a handout which summarizes the National Institute on Alcohol Abuse & Alcoholism’s Tiers of Effectiveness which can be downloaded here. There are many steps to building a successful coalition. To help, please see 'Building Your Coalition' that can be downloaded here. Education includes all the ways a community teaches it’s members about: the community’s standards, why they are important and what will happen if they are violated. Education about the community’s alcohol standards might focus on college students, owner and servers a licensed drinking establishments, parents, lawmakers and tourists, and event-goers to the campus and community. Learn more about how this approach works. The NU Directions 5 Year Report can be downloaded here. Joining the NCC will help your campus. Opportunities to meet with campus alcohol task force members from other institutions of higher education. Technical assistance at all steps of the program development process, from initial needs assessment to program evaluation. An online College Alcohol Profile and/or Year One College Alcohol Profile customized for each campus. Assistance with program evaluation and drinking data analysis. Travel support to attend state, regional and national training opportunities. Mini-grant funds for high-risk drinking prevention programs on each campus. Opportunities to join local prevention coalitions and apply for state and federal substance abuse prevention grants. For more information contact us at ncc1@unl.edu or by phone at 402-853-4388.